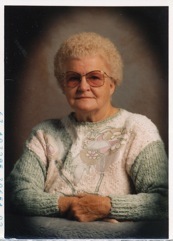 [November 12, 2010] LINCOLN -- Helen Ruth McBryant Hodgdon, 87, of Lincoln, died Tuesday, Nov. 9, 2010, at 4:15 p.m. at St. Clara's Manor. 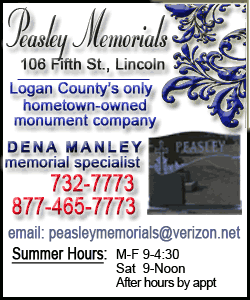 Her graveside service will be at 10 a.m. Friday at Zion Cemetery. 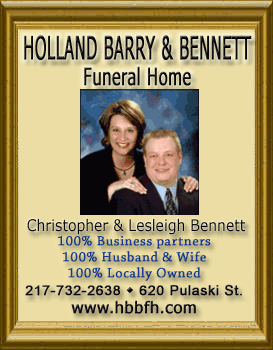 Holland Barry & Bennett Funeral Home is handling arrangements. Helen was born Oct. 25, 1923, at Burton View. Her parents were John Schaub and Edith Ackerson French. She married Russell F. McBryant on Feb. 26, 1941. He preceded her in death on May 26, 1971. 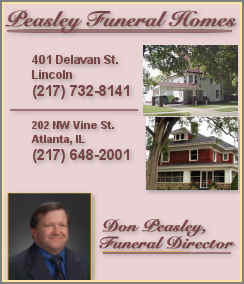 She is survived by one son, Russell D. McBryant (and Betty) of Bell Buckle, Tenn.; two daughters, Helen D. Parker (and Larry Hamblen) of Beason and Dolores D. Eads (and Mike) of Hartsburg; seven grandchildren; 14 great-grandchildren; four great-great-grandchildren; one sister, Marie Felton of Lincoln; and one brother, Dale French. She was also preceded in death by one brother, Raymond H. Schaub; two sisters, Gladys Vonderheide and Lorene Yakey; and one great-grandson, Blake A. Kavanaugh. Memorial donations may be made to the activity department at St. Clara's Manor. Click here to send a note of condolence to the Hodgdon family.